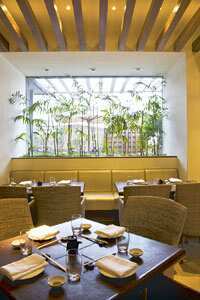 Back to basics: Architect Nozer Wadia uses sparse groupings of bamboo in the restaurant . Japanese food restaurant Ai gave architect Nozer Wadia a chance to implement an intelligent minimalist design, based on traditional Japanese motifs—as opposed to the many “minimalist" lounges around town that have no basis for their design choice. Conceived by Olive Restaurants and partners Divia and Joel Cadbury, the 16,000 sq. ft bar, lounge and restaurant was launched recently in the Metropolitan Mall in south Delhi. The space has been divided into three almost wholly self-sufficient areas: a Jazz bar, a restaurant and an outdoor bar. Each has a separate entrance and its own particular look, though they all toe the line of contemporary minimalism. The outdoor bar has stone walkways, a bonsai tree, a waterfall and a stream following the pathway, large circular divan chairs, and a loose-pebble floor around the bar. The look references traditional Japanese rock gardens. The final space, a piano Jazz bar, veers the furthest from the Japanese minimalist style, though it still intelligently nods to Japanese-inspired design. The wall separating the Jazz bar from the restaurant is see-through red gauze with bamboo placed behind it, creating a striking graphic image. Wonderfully whimsical rose chairs designed by Masanori Umeda add to the sensual atmosphere of the place. Wadia has been able to implement the minimalist design without it coming across as out-of-place or disjointed, as many minimalist lounges appear because of their misinterpretation of the design’s origins. Wadia, however, sticks to the traditional Japanese design and has used authentic themes such as few embellishments, natural fibres and water features. He also does not overdo his references to Japan, but—as with the single bonsai tree in the lounge pathway—he does smartly acknowledge it. The only major design flaw is actually an architectural one: the restaurant has one bathroom. Not only is 16,000 sq. ft an awfully long way to hike in stilettos to access the washroom, guests have to exit from whichever space they are in and re-enter the restaurant. Since the restaurant sits in a mall, it’s jarring to leave the seductive space Wadia has created, get a glimpse of the boring mall and then re-enter just to use the washroom. Rose chairs similar to the ones at Ai can be sourced from Edra at www.edra.com. Find out how to grow bonsai trees through the Indian Bonsai Association, New Delhi (www.bonsaiindia.net). Source similar stoneware square plates and tea glasses from The Next Shop, N-Block Market, Greater Kailash-I, New Delhi.